A delightfully elegant waterbird with ornate head plumes which led to its being hunted for its feathers, almost leading to its extermination from the UK. 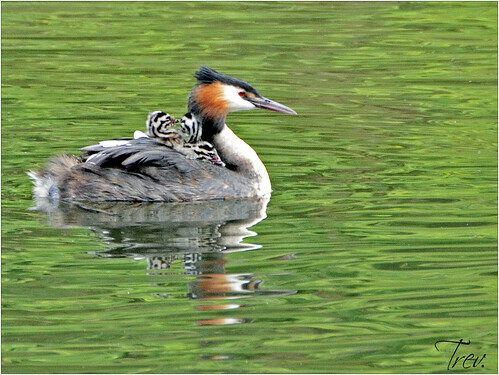 They dive to feed and also to escape, preferring this to flying. On land they are clumsy because their feet are placed so far back on their bodies. They have an elaborate courtship display in which they rise out of the water and shake their heads. 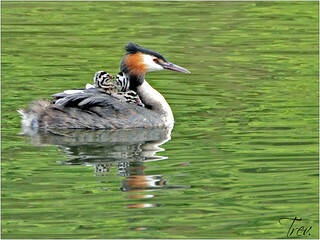 Very young grebes often ride on their parents' backs. Seen in ipernity EXPLORE page 4 on 13th July 2014.